Tottenham welcome Manchester United at White Hart Lane on Sunday, and both teams are in desperate need for a win as they are respectively battling for the Premier League title and Champions League qualification. 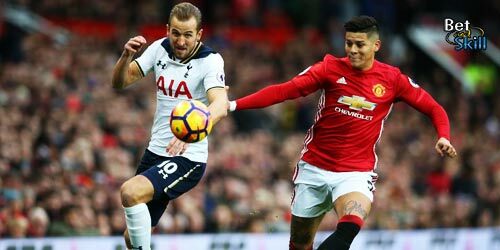 Check out here our TOTTENHAM v MANCHESTER UTD betting preview with expert predictions, betting tips, enhanced odds, probable lineups, bookie offers and no deposit free bets on the big match! Tottenham lost ground in the title race as they were held to a 1-1 draw with Liverpool last time out and the Spurs are now seven points behind Premier League leaders. Anything less than three points could all but hand Leicester the title. Pochettino's men have only lost one game in their last 11 Premier League outings. Erik Lamela is expected to return in the offensive midfield trio with Dele Alli and Christian Eriksen, replacing Heung Min-Son. arry Kane will continue to lead the Tottenham attack. Changes are also unlikely in central midfield, with Eric Dier and Mousa Dembele the favoured pairing. Clinton N'Jie and Jan Vertonghen heave recently returned to training but they are unlikely to feature. Nabil Bentaleb remains out. Man UTD have notched up back-to-back 1-0 victories over Manchester City and Everton in the Premier League in their last two games but they have also lost two of their last three away league games. As a result, Man United currently sit fifth in the Premier League table on 53 points. They are just one point shy of fourth-placed Manchester City and actually only five points off third-placed Arsenal. Phil Jones, Ashley Young and Antonio Valencia are all now available for first-team selection. Daley Blind is expected to recover in time and to start the match alongside Matteo Darmian, Chris Smalling and Marcos Rojo in defense. Juan Mata, Jesse Lingard and Anthony Martial look set to form the attacking midfield trio once more, with Marcus Rashford the lone striker altough Wayne Rooney has been tipped to make his first appearance since February this weekend. Louis van Gaal is without Luke Shaw, Wayne Rooney, Will Keane and Bastian Schweinsteiger. Man Utd are undefeated in 31 of their last 33 matches against Tottenham in all competitions. On the opening day of the season the two met in a close one at Old Trafford with United just edging it 1-0 with a Kyle Walker own goal the difference between the two sides. In the last three meetings between the two at White Hart Lane nothing could separate the pair with every match ending in a draw. TOTTENHAM (4-2-3-1): Lloris; Walker, Alderweireld, Wimmer, Rose; Dembele, Dier; Lamela, Alli, Eriksen; Kane. Man UTD (4-2-3-1): De Gea; Darmian, Smalling, Blind, Rojo; Carrick, Schneiderlin; Mata, Lingard, Martial; Rashford. Enhanced Odds! 6/1 Tottenham or 12/1 Man UTD to win + £100 bonus! Risk-free! Enhanced treble: 20/1 Tottenham, Leicester & Liverpool to win! Enhanced acca: 20/1 Spurs, Leicester & Liverpool to win! Price boost! 6/1 Tottenham to beat Man United! "Tottenham v Man UTD predictions, betting tips, odds and lineups (Premier League - 10.4.2016)"